2. Crush the garlic and lightly grind the cumin and put them in a bowl with the butter. Tip: You do not want all of the cumin to be ground to a powder. There should still be a few whole seeds in the mix. 4. Brush the corn liberally with the garlic cumin butter and sprinkle with salt. 5. Grill the corn, turning frequently, for 20 minutes, until the corn is fully cooked and well charred. 6. Let the corn cool slightly and the cut the nibblets from the cobs. Tip: Here is a helpful video from Toni Tanner Scott. Toni was cutting the kernels from raw corn and it was easy for her to hold the corn in her hand. For cutting a corn cob hot from the grill, a corn holder is a useful device to prevent burned fingers. This tool has the added advantage of keeping your fingers away from the knife’s edge. 7. 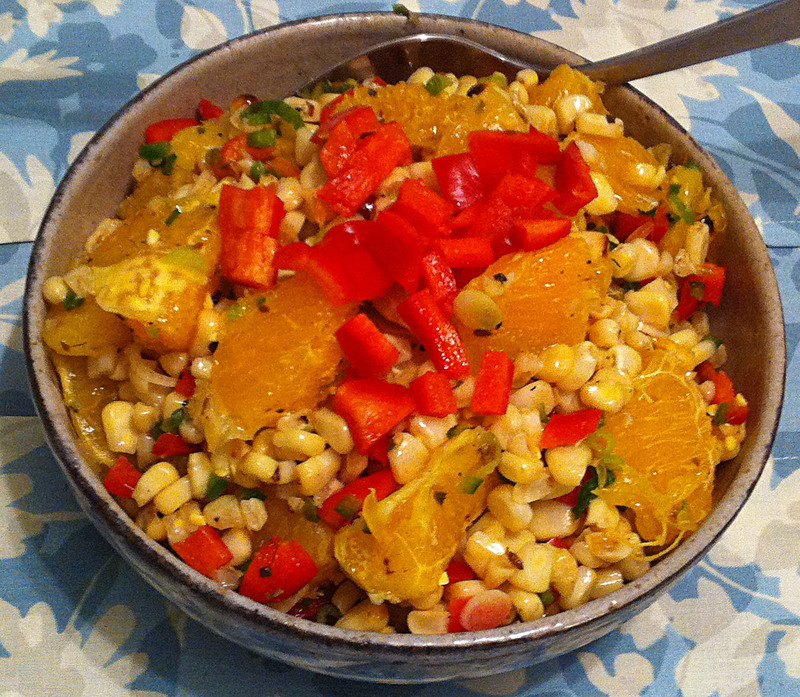 Place the corn, orange segments, green onion, Jalapeño, most of the red pepper, cilantro, oregano, and salt in a bowl and toss to mix. 8. Let the salad meld for 20 minutes, toss once more. 9. Put the salad in a serving bowl and garnish with the remaining red bell pepper.